I love doing side-by-sides with similar wines. In this case, I had the chance to give the once-over to a pair of Côtes du Rhône from slightly different classification. As a quick refresher, Côtes du Rhône is (obviously) from the Rhone region of France and is the most widely available red wine from there. 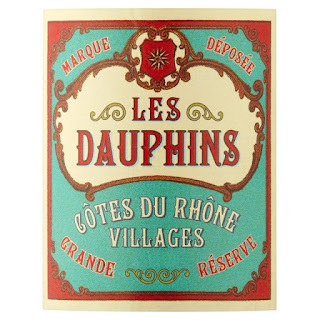 A wine labeled "Côtes du Rhône" can be made up from grapes grown anywhere within that region. This would be considered the "table" Côtes du Rhône. There are other classifications for Côtes du Rhône. A wine labeled "Côtes du Rhône Villages" indicates a higher standard of quality -- and the blend of grapes must come from the eighteen "named villages" in the region. Above that classification are those Côtes du Rhône which have the actual name of the single village from where the grapes are sourced. Puymeras, Vinsobres, and Chusclan are some examples. Finally, there are "Côtes du Rhône Cru" -- which are from the best grapes around one of the particular villages. 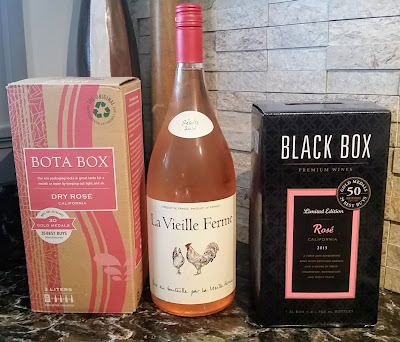 These wines are usually considered the best of the region, and some are known as the best wines in the world. Chateauneuf-de-Pape is the most famous of these Côtes du Rhône Cru, along with Côte-Rôtie, Condrieu (although mainly for whites) and Crozes-Hermitage. Côtes du Rhône are always blends. There are 21 different grapes that can go into Côtes du Rhône, but the backbone of the wine is generally Grenache and Syrah. Wines from the northern Rhone tend to be Syrah-driven, while the hotter southern Rhone grows more Grenache. Côtes du Rhône tend to be fruity, food-friendly wines. There's a pretty broad range of quality among Côtes du Rhône, and I was interested to see what this pair of bottles would yield. 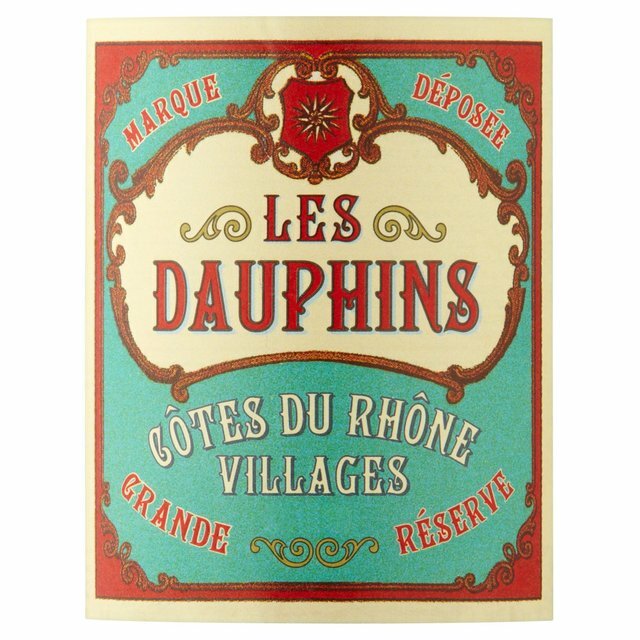 I tried the Les Dauphins 2014 Côtes du Rhône Reserve ($13) and the Les Dauphins 2015 Côtes du Rhône Villages Organic ($15). Both came primarily from the Southern Rhone, so they're Grenache-heavy. You may note the "Reserve" at the end of the name of the first bottle -- and that I didn't mention it in the classification notes above. That's the case for the simple reason that...well...the "Reserve" doesn't refer to anything really in particular. It's simply a marketing term in France, just like it is here in the U.S. The only major wine producing countries that have legal requirements for "Reserve" are Spain and Italy. The Reserve is one of the most reviewed wines on The Naked Vine -- this is the third time that it's popped up for me. It's a blend of 70% Grenache, 25% Syrah, and 5% Mourvedre. I sampled this vintage back in November around Thanksgiving time. It's a simple, straightforward, fruity red. Honestly, this bottle was so straightforward that I didn't find it particularly interesting. Red fruits came up front, followed by a middleweight palate and a softly tannic finish. The Villages was considerably better, to my taste. This was a 60/30 Grenache/Syrah split, with the remainder being divided between Mourvedre and Carignan. This was a much more interesting wine. The fruit was deeper and richer, with more plum notes and an earthier backbone. The tannins on the finish were chewier, and I thought it tasted much more "Old World" in style. We tried both alongside some steaks that I'd grilled up -- grilled or roasted meats and strong cheeses are typical accompaniments to Côtes du Rhône. Again, the Villages was the better pairing with its more muscular tannin. If you have the choice, I'd suggest dropping the extra couple of bucks and going with the Villages.